I bumped into an issue today with a Crystal Report that would not run. It had ran previously and other reports in the system were running fine. ERROR Quartz.Core.ErrorLogger – Job SlxJobService.Saleslogix.Reporting.Jobs.CrystalReportsJob threw an exception. What the… ?? Considering what I was doing, none of this made any sense. My report was correct. 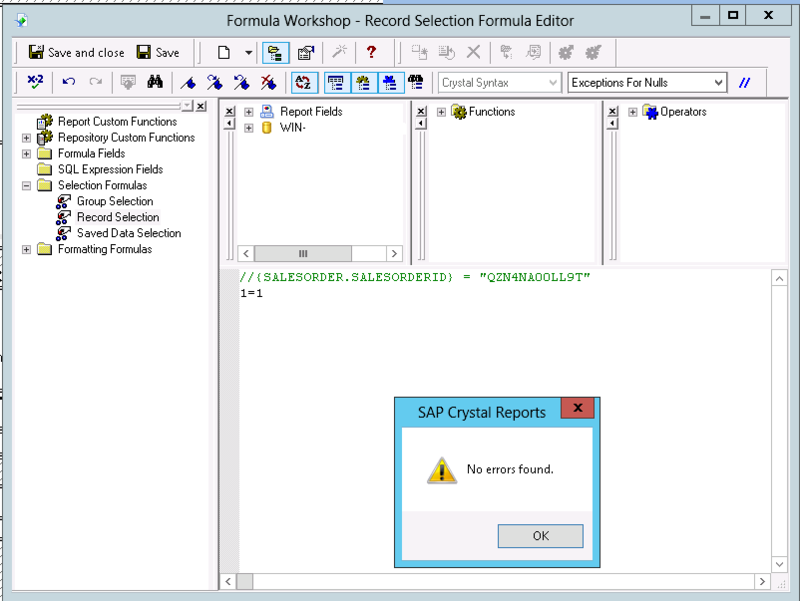 It ran fine outside of InforCRM, and Validating items in Crystal showed all items as valid. The problem was due to a comment I had in the record selection formula. 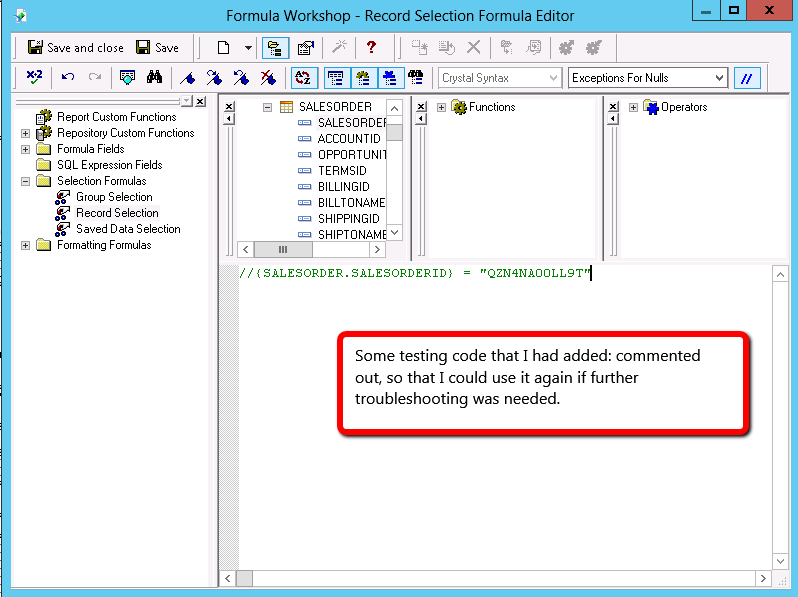 Apparently, if you have commented-out code with no other text, the report cannot be run from InforCRM. Apparently, this is an issue now. To get around this, you have a couple options. First of all, you could remove the commented-out code. If the Record selection criterion is empty, then there is no issue. If, however; you want to keep that information there (like in my case, to save testing code), then you can also add something after the comment that would resolve as “True” in crystal. As long as it has something valid, it should be fine. So, adding something like “1=1” Should come up as valid (no errors found), and will allow the report to run from InforCRM while also keeping your comments. Which version(s) of Infor CRM was this tested on…..and have you filed this as a bug with Infor? This specific case was in 8.2 update 02, and as far as I know, it is still an issue with 8.3. I haven’t reported this as a bug (yet). I wanted to test it on 8.3 and possibly a couple versions down first. Thank you for this post, however I have this issue today even without such commented out filters.